There’s something wonderful about winter grasses. Could it be that bright warm golden glow? Could it be the way they sound bending in the wind? Could it be the way they poke out of the snow? Yes, all of these above make winter grasses so special. 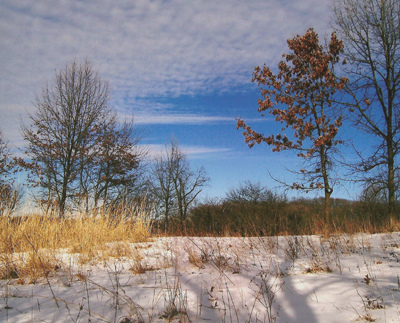 This picture was taken on a hike last winter in Spears Woods. 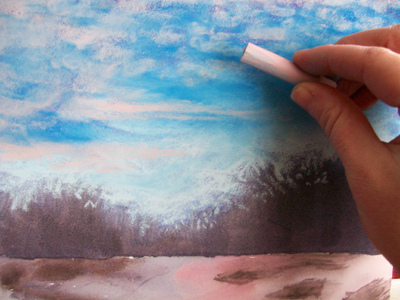 Let’s get going and paint winter grasses in pastels with a watercolor underwash. Step 1: I am using an 8×10 Ampersand Pastelbord. Take a charcoal pencil and make a quick sketch. Step 2: Turn the board upside-down. We are going to paint the background with watercolors and we want the colors to blend. Gravity is going to pull the paint down, so use the lightest color first. 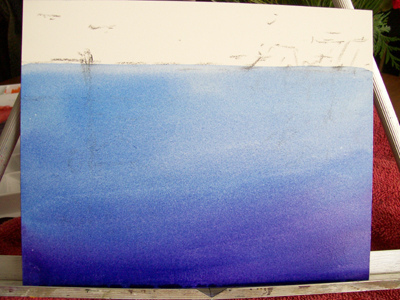 Starting with the horizon line, paint manganese blue. In the middle paint with french ultramarine and at the bottom paint a mauve color. Step 3: While the board is still wet, paint the distant trees by mixing burnt umber and french ultramarine blue watercolor paints. Start at the horizon line and paint downward making flicking stokes at the end. Don’t paint straight across, make a scalloped edge to represent various tree sizes. Dry the board with a hair dryer. Step 4: After the board is dry turn it right side up. Now paint the bottom. 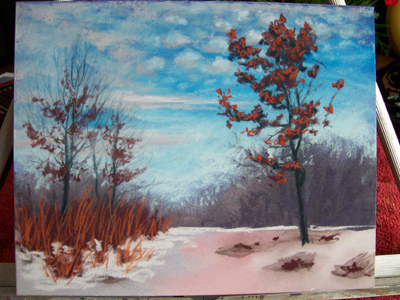 I like to add color under my snow, so I used some blue on my palette and also alizarin crimson. 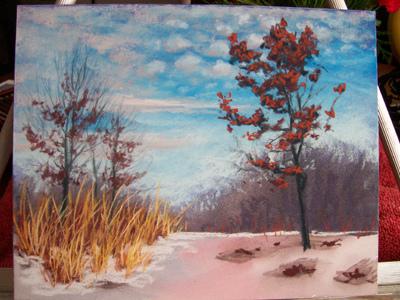 Where the patches of grass will be, take your background tree color and paint spots in the snow. We are done with watercolors. 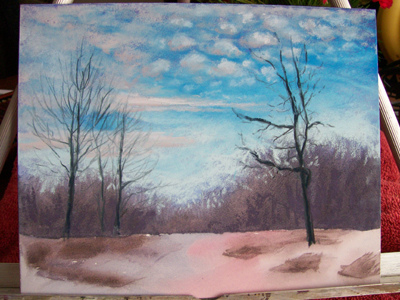 Moving on to pastels…. Step 5: POW POW POW! Look how the pastel color almost jumps off the page! Awesome! 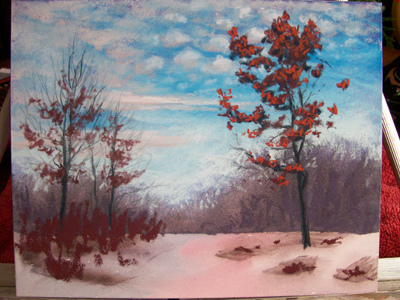 I am using Rembrandt pastels; take a dark sky blue and start at the top. Don’t cover every little inch, let some of the purple watercolor wash show through. In the middle of the sky use a medium sky blue pastel and closer to the horizon, use a very light sky blue. Where the sky touches the top of the distant trees, go in and out, suggesting some branches. Step 6: Now, I could have stopped at just a blue sky (the easy way out), but my picture has terrific altocumulus clouds and those clouds typically mean changing weather within a day and I want to capture that! 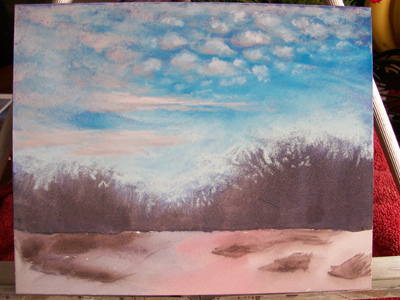 Altocumulus clouds are not the easiest thing in the world to paint, but is easy going to move you up to the next level? Is easy going to challenge you? 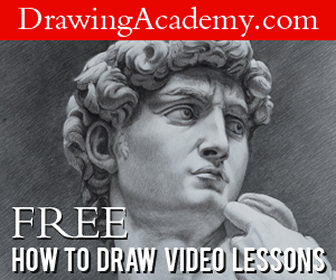 Will it make you a stronger artist? No way, it will not. We will always move forward no matter what challenges we face. We will not slide backwards. If we fail, we will learn what not to do next time and because we learned something, we can not fail. Do you see!?! You can not fail. 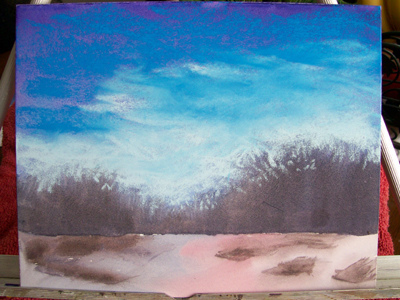 For the clouds, I am using a medium-light purple/gray pastel (see picture). Make small circular clouds in the sky. Space them out a bit so the blue of the sky shows through. Next take a light purple/gray pastel and paint the top and middle of each cloud. Finally, take the light blue pastel for the sky and paint the top of each cloud. Here is how the sky turned out. Just a bunch of circular clouds and in the distance, horizontal lines. Nice. 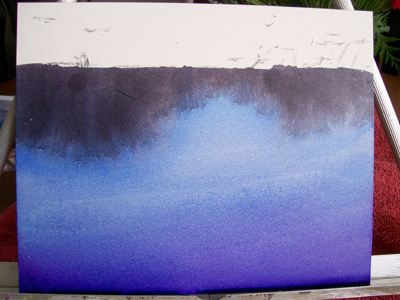 Step 7: Take a dark blue pastel pencil and draw in some trees. The ones to the left are further back and will be behind the grasses. The one to the right is closer to the foreground. Step 8: Paint some oak leaves. I used a dark blue pastel for the base color and then a dark burgundy pastel on top. If I don’t paint these dark colors first, the bright leaves will not show up. We need contrast. Step 9: Paint a light burgundy pastel on the tree. Don’t cover the whole thing, let some dark spots show through. Step 10: Now for those fantastic grasses! Just like the oak tree, I need contrast. If I started painting with a yellow grass color, the grasses would not pop out. I need something dark behind it. 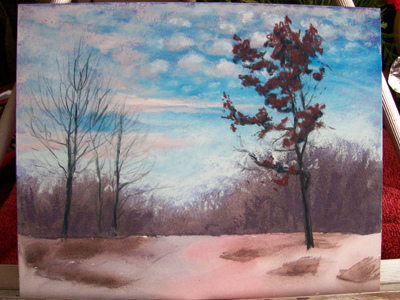 I took the same dark burgundy pastel that I used for the tree and painted in a patch of grass. Then I took the light burgundy pastel and made some thin sweeping lines. 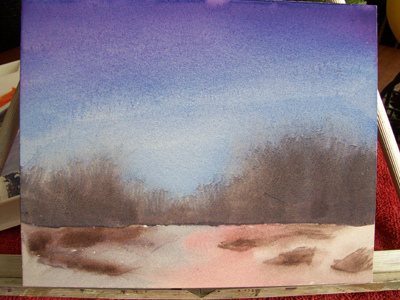 Using the lightest blue for the sky, I paint some snow on the bottom. 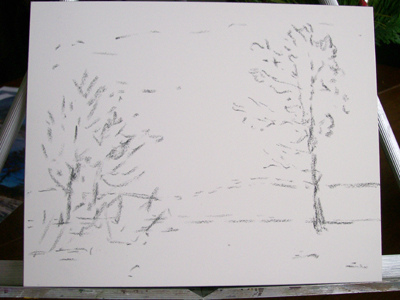 Step 11: Take a golden tan pastel and make some more sweeping lines over the burgundy grass. Now doesn’t that stand out? Looks great. Step 12 Final: Make some more grasses using the same steps as before on the right side of the painting. Fill in the rest of the snow with medium and lightest blue pastel. To add some sparkle, paint a few oak leaves pure orange. Yesssssss! 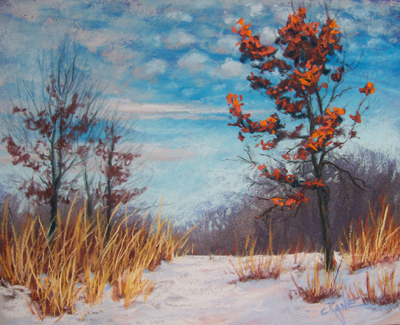 I hope you enjoyed this free step-by-step pastel demonstration on how to paint winter grasses. Remember, if you try this yourself, you can upload your results on the Let’s Paint Nature Facebook page. thanks, for training, I injoy it. i like it!!!!!!!!!!!!!!!!!!!!!!!!!!!!!! flowerZ to u!!!!!!!!!!!!!!!!!!!!!!!! i want more of these step by step paintingZ!!! Absolutely fantastic! Your tutorials are so helpful and your words so encouraging – especially where you talk about trying things that are not easy! What helpful words of advice. I love your paintings and am so excited to try and learn from your tutorials! Thanks so much for sharing!